In the last few decades, DNA analysis has transformed the field of microbiology. Almost all research of microbes utilize DNA methodology. The NIH has followed suit with initiatives including the Human Microbiome Project, which characterized the microbiome of 15 habitats of the body using DNA analysis. More than ever before, we are keenly aware of the health benefits or disease risks brought about by the microorganisms that inhabit the human body. Culture techniques, previously the standard, left up to 50% of bacterial species virtually invisible. Because most of the bacteria of the GI tract are anaerobes, culture-based methods cannot cultivate them which leaves a large blind spot for clinicians when trying to diagnose the source of infection. Diagnostic Solutions Laboratory is pleased to partner with you to bring true ADVANCES in microbial testing. Our commitment to laboratory medicine is to utilize proven methodologies that are accurate and reliable. 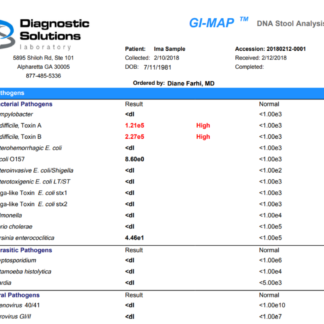 We are pleased to offer clinicians the first of many advances, the GI-MAP™. 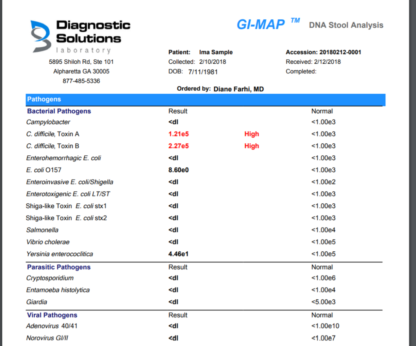 The GI-MAP (GI Microbial Assay Plus) stool test utilizes cutting edge, Quantitative PCR technology to provide a true DNA/PCR based stool test. This technology has high sensitivity, specificity, and a rapid turnaround. 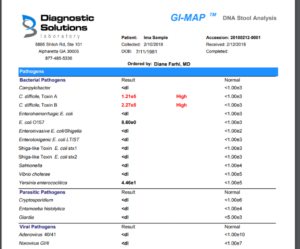 The GI pathogens include bacteria, parasites, and viruses. Continuing with this platform, the GI-MAP measures opportunistic organisms, normal flora, fungi, parasites, and antibiotic resistance genes. And the Plus refers to immunologic markers for GI health and function including SIgA, Elastase, Calprotectin and Anti-gliadin testing.